Walther Arms, Inc, the U.S-based organization for Carl Walther GmbH of Germany, has launched a new website highlighting the entire 2013 line of German-engineered pistols and tactical rimfire replicas. 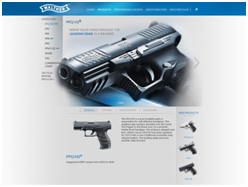 The site is designed to educate prospective dealers, customers and avid shooters on the Walther portfolio of firearms. The new URL is www.WaltherArms.com and was launched January 1st as the strategic alliance with Walther and Smith-Wesson expired. Thomas says the launch was the initial marketing vehicle for Walther Arms, Inc and is only in the initial phase. The second phase will include a vibrant ecommerce area, easy online product registration portal and private area for the working media to learn about Walther products and access product photography. It is targeted for completion by the end of the first quarter of 2013. The highlights of the website include 2013 new Walther products including features diagrams, popular accessories, links to Walther’s Facebook (www.facebook/waltherarms), and Twitter (@WaltherFirearms) social media sites. The new site features easy top and side navigation, large, full-color beauty shots of Walther products and exploding diagrams of product features that work on all mobile devices as well as traditional computers. Development of the site was spearheaded by Walther’s e-marketing specialist, Joe McCoy and designed by Papagalos Strategic Communications, Phoenix Arizona. Entering its 130th year, Walther has earned the trust of law enforcement professionals, recreational shooters, and athletes through its line of reliable PPQ, PPS and PPK pistols. Walther Arms manufactures and markets firearms of various calibers ranging from .22 to .40. For more information, visit www.WaltherArms.com.